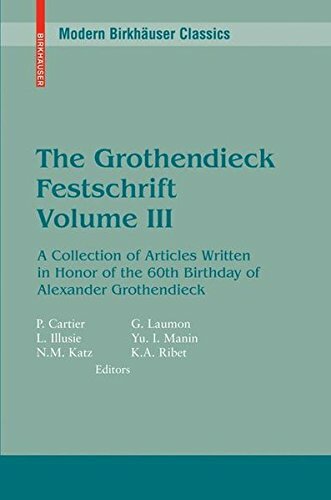 Descargue o lea el libro de 3: The Grothendieck Festschrift, Volume III: A Collection of Articles Written in Honor of the 60th Birthday of Alexander Grothendieck (Modern Birkhäuser Classics) (English and French Edition): v. 3 de From Birkhäuser Boston en formato PDF y EPUB. Aquí puedes descargar cualquier libro en formato PDF o Epub gratis. Use el botón disponible en esta página para descargar o leer libros en línea. This three-volume work contains articles collected on the occasion of Alexander Grothendieck's sixtieth birthday and originally published in 1990. The articles were offered as a tribute to one of the world's greatest living mathematicians. Many of the groundbreaking contributions in these volumes contain material that is now considered foundational to the subject. Topics addressed by these top-notch contributors match the breadth of Grothendieck's own interests, including: functional analysis, algebraic geometry, algebraic topology, number theory, representation theory, K-theory, category theory, and homological algebra. The many diverse articles presented in these three volumes, collected on the occasion of Alexander Grothendieck’s sixtieth birthday and originally published in 1990, were offered as a tribute to one of the world’s greatest living mathematicians. Grothendieck changed the very way we think about many branches of mathematics. Many of his ideas, revolutionary when introduced, now seem so natural as to have been inevitable. Indeed, it is difficult to fully grasp the influence his vast contributions to modern mathematics have subsequently had on new generations of mathematicians. Many of the groundbreaking contributions in these volumes contain material that is now considered foundational to the subject. Topics addressed by these top-notch contributors match the breadth of Grothendieck’s own interests, including: functional analysis, algebraic geometry, algebraic topology, number theory, representation theory, K-theory, category theory, and homological algebra. CONTRIBUTORS to Volume III: A. Lascoux; S. Lichtenbaum; G. Lusztig; Z. Mebkhout; A. Ogus; A.N. Parshin; M. Raynaud; G.B. Shabat; L. Szpiro; R. Thomason; A. Treibich; T.F. Trobaugh; J.-L. Verdier; V.A. Voevodsky; and Y.G. Zarhin.